UDM Downloads > Malware Sweeper Free! 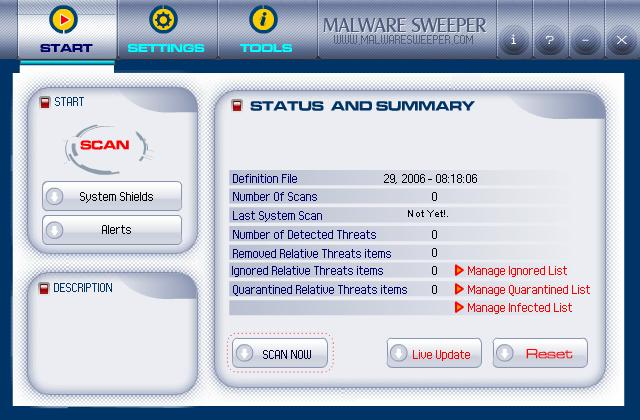 MalwareSweeper is an Adware, SpyWare, Key Loggers, Trojans, Dialers, Hijackers, malware, Thiefware, Big Brotherware removal utility. It scans your memory (for active memory ad components, which are not stored on your hard drive and last only as long as the computer is powered up), registry, & drives for known adware modules & for known SpyWare parasites & scum-ware components and lets you remove them safely from your system. Also removes Bundled spyware components from Kazaa, Morpheus, audiogalaxy, grokster, Limewire, Imesh, Gnutella & 1000+ other programs. SpyWare apps, often installed without your knowledge, send information about your surfing habits to ad companies, which, in turn, send you more popup ads. New features include a new Spy Add/Remove utility which uses the installer log files to uninstall all the components that the spyware programs have installed on your PC system, and an automatic update system that keeps your level of protection up-to-date. It also Includes System Shields run in the background to monitor the sanity of the running programs to protect the user from malicious malware. The alerts will fire if any of the shields catches malware.You can Resets the statistical data on the status & summary window. You can also browse to choose the location where the Quarantined & Log Files will be saved in. Any changes in these settings will not be applied if you don't click the save button. You can change the scanning options to customize your scan according to your needs. You can choose to set a scheduled scan for your computer to automatically scan your PC periodically or to select None and apply your own manual scan. you can manage the list of ignored or quarantined malware by adding and removing from them. Currently we have the largest correct database of spyware components that gets searched for. Our spyware scanning engine has built in smart search capabilities that catches new spyware components.The fastest scanner on the market .